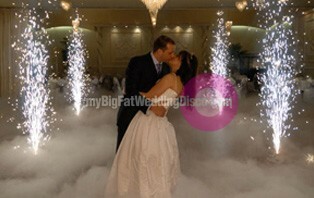 Pyrotechnic effects create a fantastic visual element to your first dance photos and will wow all your guests. When used, they create an indoor firework display which lasts around 30 seconds long – enough time for all your guests to snap a romantic picture of you and your partner. These effects are controlled devices that are ignited from distance from our trained staff. Each display is safely positioned before your evening begins and safe until required. It’s common to have the feature effect positioned against a back or side wall next to the dance floor. However, some bride and grooms have added glamour to their entrance as they enter a room for the evening in front of all their welcoming guests. Contact us for more information about this service, as it is always important to understand your exact requirements before quoting. We are licensed and trained to use display pyrotechnics.